Blog reader Lois said it best in a comment to the last post: “… I sense that all of the senses are keenly awakened by what you are experiencing in this unique adventure.” She is so right, this is an environment that fills all the senses all the time. The views, the subtle colors, the plant smells, the rain-like mist or sun and the sounds. 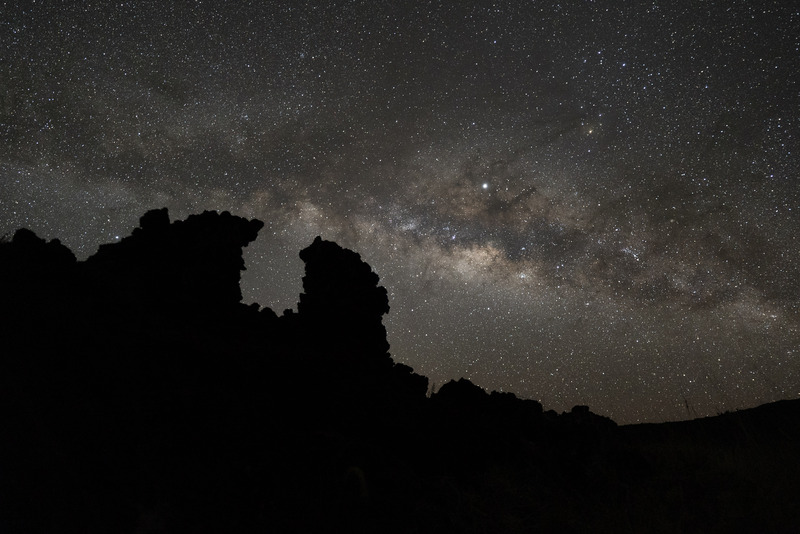 The park information says inside the Haleakala crater is one of the quietest places in the world and it truly seems that way. It’s not silence, there is a quiet that lets you know there is an environment out there living and breathing. Often in the evenings I would hear distant sounds, just perceptible, almost a single noise, unsure of what it is. I realized it was the call of hundreds of ‘ua’u birds (“oooo ah oo”) nesting in the crevasses of the volcano walls. After showing Ranger Honeygirl a selection of the photos I’ve shot, she said Hanakauhi, the mountain in the background of the ‘ahinahina image I posted last time, means “maker of mist” in Hawaiian. A very descriptive name since clouds and mist seem to emanate directly from the mountain. In the crater I could sit and watch clouds form and dissipate and roll on by from the Holua cabin. It could be perfectly clear and two minutes later almost overcast. The clouds seem to move by as if I was watching a time-lapse film speeded up, though it was happening in real time in front of me. Thought I would show other images from my time in the crater. 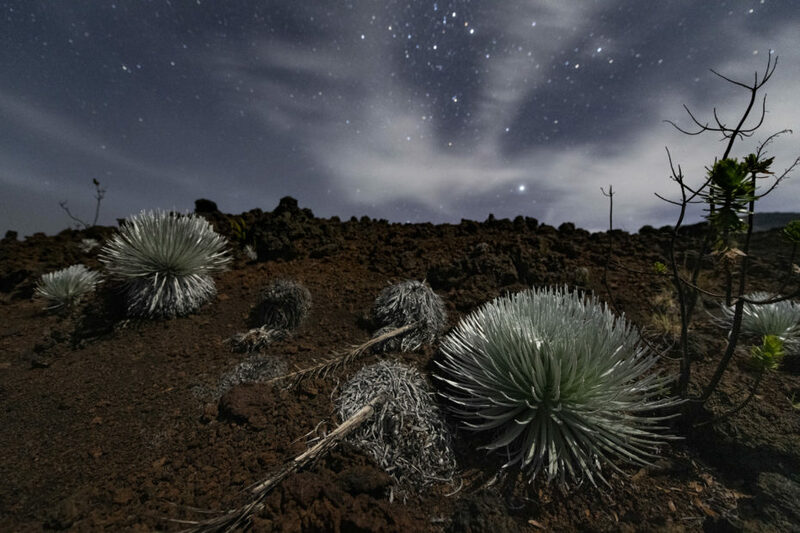 The plants are remarkable looking in the light of a quarter moon, which provides all the landscape illumination in these photos. 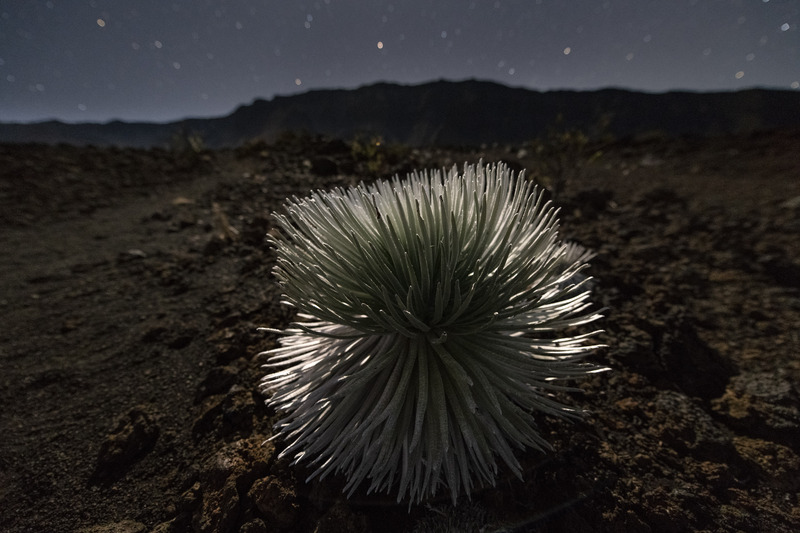 ‘Ahinahina lit by the moon. ‘Ili’ahi (sandalwood) tree, endemic (grows only in Haleakala) and rare. An upturned Big Dipper hovers overhead. 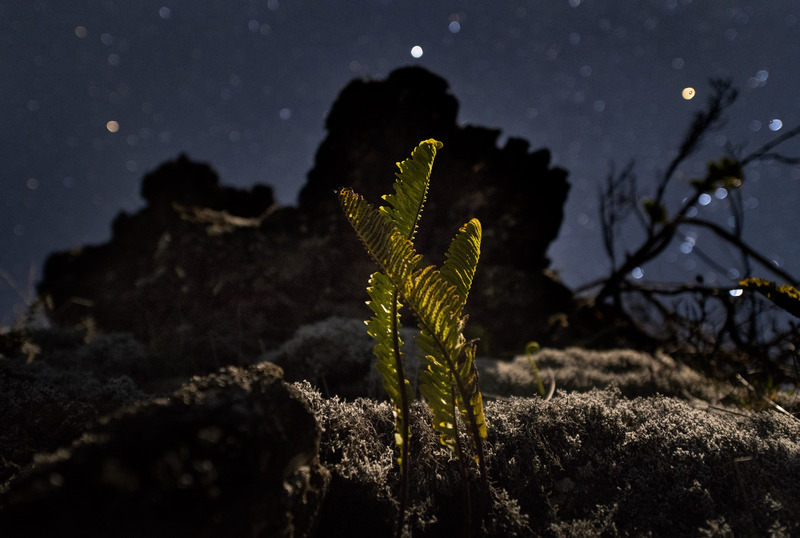 ‘A’e (fern) growing out of lava formations. 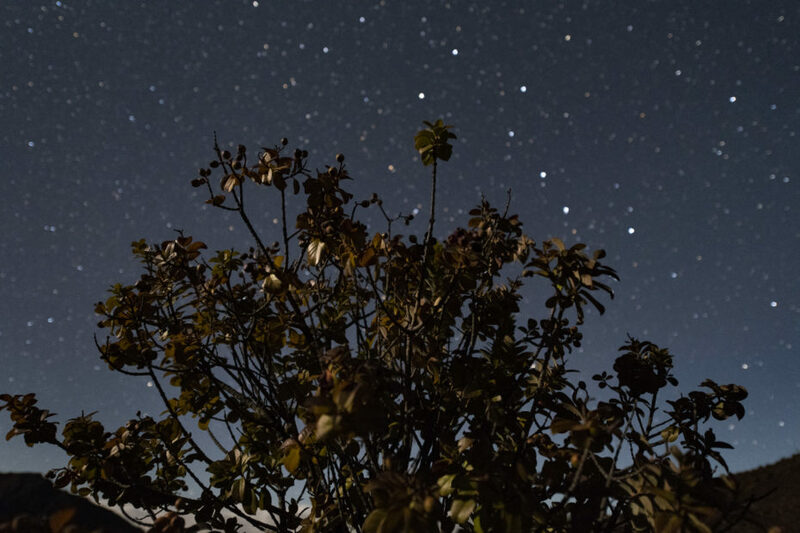 The bright stars are from left to right, Alphard (in Hydra), Procyon (Canis Minor) and Betelgeuse (Orion).